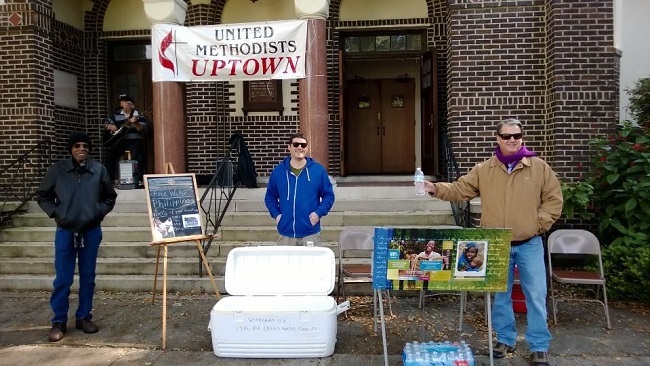 The United Methodist Men of Carrollton UMC spent several hours in front of the church building Nov. 24 handing out free water to those on their way to the Po Boy Festival in Uptown New Orleans. Donations were also accepted to be sent to UMCOR's current relief efforts in the Philippines. “We even had people quickly stop their cars, jump out to grab some water, and leave a donation! Traffic was moving very slowly,” said Lisa Lord, wife of the church’s pastor, Rev. Jon Lord. Members of the UM Men’s group worked in shifts while Rev. Lord entertained passers-by on guitar (shown on porch of the church building). Carrollton UMC’s UM Men have recently received a new charter; the official charter ceremony will take place Dec. 1.